A factory has undertaken two printing services of Nanjing University Press: "Junior Mathematics" and "Junior Mathematics". Among them, "3rd Mathematics" is printed with 25,000 copies, and printed on "Junior Mathematics". The number is 60,000. In order to save raw materials and reduce costs, at the time of platemaking, â€œJune 3 mathematicsâ€ selected the PS version of the recycled positive chart. Basically, it is sufficient for each printed sheet to use a set of printing plates (except for special cases). The new positive YP-IIPS version, as a result, the printing plate made with the positive YP-IIPS plate is not as good as the printing plate strength of the PS plate. After careful analysis, it was found that the thickness of the printing plate itself is the main reason. Our factory adopts the JS2102 Offset Press (hereinafter referred to as double-sided offset printing press) for printing, the upper and lower printing plates of the double-sided offset printing press, and especially the printing plates made of the recycled positive drawing PS plate, whose thickness is below 0.3mm. . Some PS plates are electrolyzed for many times. The thickness of the plates is not the same as the thickness of plates that have been electrolyzed only once. Therefore, each plate has different requirements for the thickness of the plate. Therefore, the pressure of the impression cylinder on each plate cannot be exactly the same. The uneven thickness of the plates is as follows. 1. On the same roller, the thickness of the first plate (the thickness at this time is only compared between the plates) is thinner than the thickness of the second plate, so when the first plate is loaded, the pressure The liner was adjusted according to the requirements of the first printing plate, but when the second printing plate was installed, because the thickness changed, the requirements changed, although the printing plate was tightly fixed on the roller. Due to the relative increase in the thickness of the printing plate, the pressure on the printing plate becomes large, and it becomes naturally liable to be damaged, resulting in a corresponding decrease in the resistance force. 2. On the same roller, the first plate is thicker than the second plate. When the first plate is installed, the pressure and the gasket are adjusted according to the requirements of the first plate, but When two printing plates are used, the pressure is reduced relative to the second printing plate. It does not meet the normal operation requirements. The graphic on the printed matter will become unclear. In this case, the machine will be damaged even if it operates normally. Plates affect their resistance to printing forces. If the plate was originally made from a recycled positive PS plate, the plate made by YP-IIPS was suddenly replaced on the way, and the pressure of the press and the pad of the plate were not adjusted accordingly. The pressures that are endured must change, and the plates will be damaged. Under normal circumstances, when the printing plate is replaced and the printing plate made of the new PS plate is replaced with a recycled positive PS plate, the machine must be readjusted. In addition, suppliers who can not freely change the plate, different manufacturers, the positive version of the PS plate used in the production of the version of the base (aluminum) thickness will inevitably be different. The base plate thickness of Xinyangtu PS plate is 0.3mm. Among them, the error of 0.02-0.03mm is difficult to detect with the naked eye and can only be measured with the aid of a micrometer. Therefore, it is best for printing companies to stabilize the supply channels of raw materials and not to change them frequently, otherwise it will make operators feel inexperienced and not conducive to work. Welcome to visit our page of Aluminum Jars & Bottles. 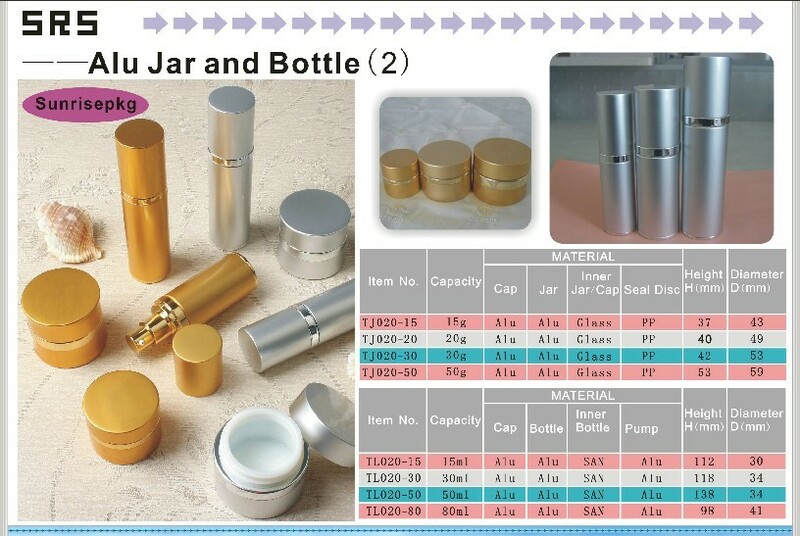 Our Aluminum Packaging include Aluminum Containers and Aluminum Lotion Bottles. Alu. Material packaging have their unique oxidation processing. This special feature make them own the same rich color like plastic bottles & jars packaging. Although Alu. Bottles & Jars Styles applying to Cosmetics packaging are not so many as glass material packaging and plastic material packaging. But they also gain a quite many people's love. Classic matt/shiny silver, gold and black Alu. Jars & Bottles are still hot-sales! Alu. Cream Jars or Alu. Gel Containers also have wholy sizes available, including 5ml, 7ml, 15ml, 20ml, 30ml, 50ml, 100ml even 200ml. From 5g/7g small aluminum pot for trial sample and promotion using, to 100g/200g for beauty spa and beauty salon using. Alu. Cosmetic Jars & bottles have fully displayed their wide usage!